Mood board: It’s hard to believe that it’s been twenty years since Narciso Rodriguez’s take on minimalism and femininity first came to be. To properly celebrate, Rodriguez released a capsule collection of revisited and reworked archive designs at Barneys last week. For his latest collection however, the designer only looked forward. Armed with a succinct 17 looks, Rodriguez proved to be in his element with garments that seemed fluid, yet provided an architecture for the human form. Using a restrained palette of black, white, bronze and moss, Rodriguez allowed the integrity and design of the garments to simply speak for themselves. 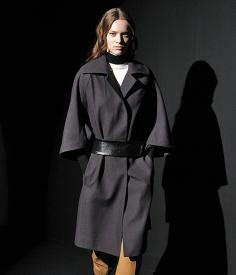 Scene setting: Narciso Rodriguez is renowned for his sleek and minimalist take on womenswear. True to his elegant and unfussy aesthetic, the collection which came after his twentieth annivesary celebration, was presented to a tiny audience at his showroom. Best in show: Rodriguez might be best known for his figure skimming dresses, but this season, a more androgynous aesthetic took hold. From the addition of dolman sleeves to an oversized coat to the presence of a nonchalant slouchiness in a two-tone jumpsuit, this masculine quality gave the collection a modern sexiness and seductive appeal.